i. The Ease of Living Index 2018 was released by Union Minister Hardeep Singh Puri with few most prominent cities failing to make a cut in the top 10. Of total 111 cities ranked under the index, Pune has been ranked first while Navi Mumbai has surfaced as the second preferred spot in terms of 'liveability'. ii. All the cities have been ranked on the basis of four parameters viz. institutional, social, economic and physical. i. The Union Home Minister Rajnath Singh has rolled out the Smart City projects that will help New Delhi emerge as a world-class city. The projects are undertaken by the New Delhi Municipal Council (NDMC). ii. The various projects inaugurated by Rajnath Singh include Smart Poles, Solar Tree, Ideation Centre, 50 LED interactive screens, Ambedkar Vatika and various other things. i. Chhattisgarh Chief Minister Raman Singh announced that Chhattisgarh is the first among the 28 other states in the country to provide Right to Skills’ Development to the youth. ii. The Chief Minister along with Union Minister of State for Skill Development Anant Kumar Hegde flagged off fifteen Skill Chariots to launch the government’s project of ‘Skills on Wheels’ in the state. · Baleramji Dass Tandon is the present Governor of Chhattisgarh. i. National Wildlife Genetic Resource Bank (NWGRB) was inaugurated at Centre for Cellular and Molecular Biology’s (CCMB) Laboratory of Conservation of Endangered Species (LaCONES) facility in Hyderabad, Telangana. ii. It is India’s first genetic resource bank where the genetic material will be stored for posterity which will further the cause of conservation of endangered and protected animals. i. The Delhi Police inducted an all-woman Special Weapons and Tactics (SWAT) team, consisting of 36 commandos – the first ever by any police force in India – for anti-terrorist operations. Union Home Minister Rajnath Singh announced the team. ii. The team will be deployed during the Independence Day celebrations. The elite women commandos, hailing from the north-eastern states, will be deployed at strategic locations for securing the Independence Day celebrations. · Anil Baijal is the present Lt. Governor of Delhi. i. The lander on the Chandrayaan-2 mission, which is scheduled to be launched in January 2019 will be named ‘Vikram’ after Vikram Sarabhai, the father of Indian space programme. ii. This mission, unlike Chandrayaan-1 which only orbited the Moon, involves a Lander soft-landing on the lunar surface and unloading a Rover to study and take measurements from the Moon, while the orbiter will go around the Earth’s satellite. i. Country’s largest lender State Bank of India (SBI) is considered to be the most patriotic brand, according to a survey conducted by UK-based online market research and data analytics firm YouGov, followed by Tata Motors, Patanjali, Reliance Jio and BSNL. ii. The survey, which covered 152 brands across 11 categories, is based on data collected online by YouGov Omnibus among 1,193 respondents in the country using its panel of an online representation of India. i. Indian golfer Viraj Madappa became the youngest Indian to win on the Asian Tour, as he won his first title on the Asian Tour at Take Solutions Masters in Bengaluru. Viraj Madappa scored a total of 16-under 268 at the Asian Tour event. He is 20 years old. ii. Earlier this record was held by Gaganjeet Bhullar, who won the Indonesia Invitational when he was 21 years and three months old. 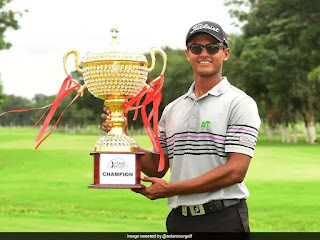 · Viraj Madappa is also the first rookie and youngest player to win on the continental Tour this season. i. The 2018 Vietnam Open officially known as YONEX-SUNRISE Vietnam Open 2018, was held at Nguyen Du Cultural Sports Club in Ho Chi Minh City, Vietnam. ii. The tournament was organized by Hochiminh City Badminton Association. Total prize money for the event was $75,000. i. Chhattisgarh Governor Balramji Das Tandon passed away at the age of 90.
ii. He was admitted to a hospital in Raipur after he suffered cardiac arrest.